Home to a bustling downtown on the waterfront, spectacular coastal views, historical buildings, and welcoming hospitality, Mystic CT is considered by many to be a top New England vacation destination and romantic weekend getaway. Mystic continues to be a foodie destination as well as many of our local restaurants continue to gain notoriety nationally such as Adam Young winning Food Networks “Best Baker in America” Sift Bakery, Dan Meiser’s Oyster Club being named One of the Best Restaurants in America and Haley Mansion at The Inn at Mystic being one of the areas top wedding venues. 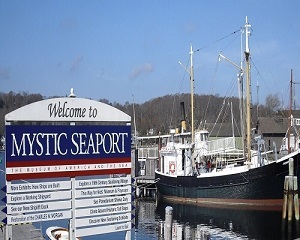 Spend your time touring the historic Mystic Seaport, Mystic Aquarium or spend the day wine tasting through Mystic’s beautiful vineyards, there are countless ways to enjoy and relax in beautiful Mystic. Grab a pint or sip on a Martini while enjoying Mystic’s vibrant upbeat nightlife at one of its many bars and restaurants in Mystic CT. Take a stroll thru downtown Mystic, located on the Mystic River, which flows into Long Island Sound, and watch the boats coming in and out of the harbor or go shopping for the day at Olde Mystick Village. You’ll love it here! Mystic CT offers the best restaurants, coastal scenery, boutiques and various activities to stay busy with your family and loved ones on your weekend getaway or vacation. There is something for everyone to do in this little village in Connecticut known as Mystic. Mystic River Paddle Board Co. Mystic CT is Beautiful, Historic and Fun! With So Much Things To Do, You Wouldn’t Want To Be Anywhere Else? Make Sure To Hit Up These Hot Spots During Your Stay at Mystic CT!